The Healer is a very strong card in Asante. The Healer let’s you search the discard pile and take 1 or 2 person cards. Your opponent has to bid on those cards. If you want the cards, you pay the amount your opponent bid to the bank. But you can also sell the cards to your opponent, who has to give you the money in return for the cards. 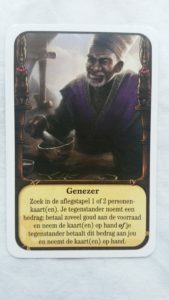 So when you play Asante, and your opponent plays the Healer, how much should you pay to get the cards the Healer just resurected? In some ways, Asante is a zero-sum game. Because there are two players, and the player with the most gold wins, something interesting happens when one player has to pay gold to the other player. If you pay gold to the bank, you loose the amount of gold you pay to the bank, nothing more, nothing less. Suppose you have 20 gold and your opponent pays 4 gold to the bank, then your opponent has only 16 gold left and you still have your 20 gold. You lead by 4 gold. But now suppose your opponent pays his 4 gold to you. Now your opponent has 16 left, but also you have now 24 gold. Now you lead by 8 gold. That’s twice as much. Gold that you have to pay to your opponent is thus twice it’s value. You should keep this mechanism in mind while bidding on the cards of the Healer. It might feel like a bargain to offer only 4 to good cards, because if your opponent decides to keep them, he has them for only 4. But in reality if you have to pay him the 4 gold, you are offering 8. How much you should bid depends largely on which person cards are in play and the former course of the game. On average it’s really really good to have many cards on hand. That is why person cards that give you cards are very valuable. Such cards are Hoornblazer (+2 cards), Wood carver (if you have or are able to buy a lot of wares), or Colonist (if you already are in the lead). If you have many ware cards, Hagler can be a strong card. Other cards, like Nomad and Smuggler, can give you a lote, and thus can be valuable as well. How much gold you should pay differs for each specific situation. In our experience, a lead of approximately 15 gold will be enough to win the game (except for when you have no cards or your opponent has a lot of wares). Therefore, paying more than 7 for the Healer’s cards is’nt such a good move (remember that’s 14 gold-difference). If the Healer resurrects exceptionally good cards for your situation or you’re only in the first few rounds of the game, 5 or 6 might be okay. In general bidding 4 is pretty decent. Do you not own Asante yet? It is a very unique game and we strongly recommend it to people that already own a lot of other games. Read more of what we write about Asante or buy Asante on Amazon through our affiliate link (we earn a commission at no extra cost to you).